There have been a good few superhero miniature games over the years, some have been pretty amazing, while others have fallen by the wayside and been all but forgotten. 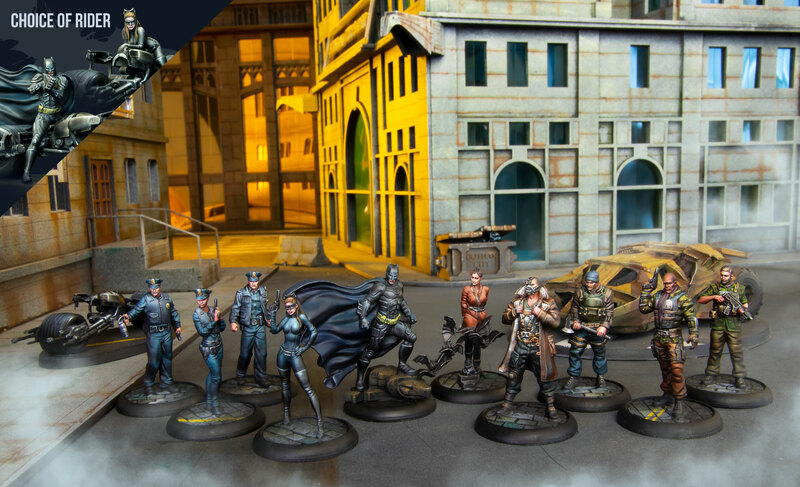 One game that has really stood out in recent years is Batman the Miniature Game, an offshoot of the DC Universe Miniature Game from Knight Models. This Spanish company produces some amazingly detailed and accurate miniatures based on characters from both film and comic books and has been a great hit with fans. Now we have a new starter set about to be released that will allow players entry into the exciting world of superhero miniature gaming and will for the first time contain vehicles. Batman (Dark Knight Rises): Having witnessed his parents’ death at the hands of a mugger, Bruce Wayne traveled the world to train and understand the criminal mind in order to combat it. employing an array of gadgets, weapons and tactics as a mysterious black-garbed crusader known as Batman. high-heel boots, and a belt filled with lockpicks. GCPD: The Gotham City Police Department is the principle law-enforcement agency in Gotham. Its officers face a constant battle against organized crime, and time and again put their lives on the line in pursuit of justice. Their love/hate relationship with Batman has caused the Dark Knight headaches in the past, but with the arrival of Bane, they must put aside their differences and work together to defeat a common enemy. To face off against Batman, the Dark Knight Rises set also contains a complete Bane Crew, ready to break the bat! single combat, he has vowed to bring Gotham to its knees. Bane’s identity is hidden behind a grotesque his mask, which inhibits the excruciating pain that wracks his body, allowing him to focus on his mission. Talia al Ghul: Following the death of her father, Ra’s al Ghul, Talia took up his mantle and patiently sought Gotham City’s destruction with the aid of her ally, Bane. She manipulated Bruce Wayne while masquerading as wealthy businesswoman and philanthropist Miranda Tate. mercenaries are highly trained militiamen, including several members of the League of Shadows. ‘tumbler’ (aka the Batmobile) includes sophisticated weaponry and jet-boost capabilities. retractable dual-barreled cannons and a multiple-tube missile launcher. The Batpod: The Batpod was intended as an escape pod integrated into the Tumbler, but also served as an auxiliary high-speed pursuit vehicle. Armed with dual front-mounted cannons, machine guns and grappling hooks, the Batpod affords Batman greater mobility at the cost of some protection. The Dark Knight Rises is available from April 16 th 2019. The fate of Gotham City is in your hands!